Believe it or not, the Chicago Bears are, per NFL betting sites, 2.5-point favorites over the Minnesota Vikings. Someone call Herbert West so that he can reanimate Robert Ripley. Because this is a turn of events that the best online sportsbooks did not see coming. The Bears may very well be the Dean Malenko of the NFL. “There’s no way you can practice every one of their plays,” Minnesota head coach Mike Zimmer said of Chicago’s playbook. “They’ve got 800 of them for every game.” Actually, they have 802 plays now. What happened? They learned two more (shoutout to Chris Jericho). On the other hand, the Vikes ate Mitch Trubisky alive last season. And they may still have room for seconds. The Vikings defense sacked the Cardinals Josh Rosen thrice. And they set a new franchise record with 10 sacks on poor Matt Stafford of the Lions. The Vikings will be underdogs against the Bears for the first time in four years. However, Minnesota didn’t always live up to that favorite status. 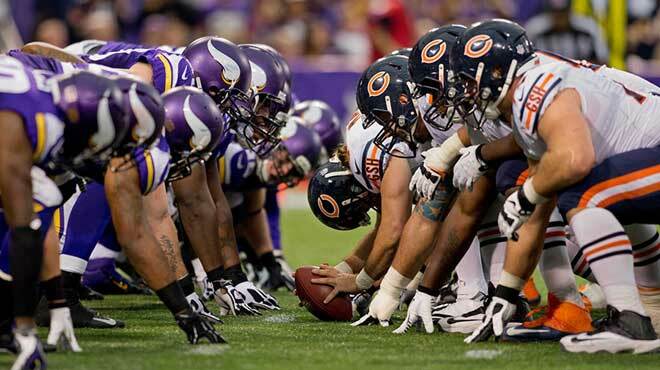 According to NFL betting sites, The Vikings are 2-8 ATS in their last 10 road games against the Bears. As expected, Minnesota’s defense is top notch. They rank 3rd against the rush, with 88.9 yards on the ground allowed per game. Moreover, they are No. 5 in total yards allowed per game (322.2). Offensively, Kirk Cousins has the Vikes ranking 8th in passing yards per game, with 282.7. The run game could use some improvement, though. The Bears are masters of their domain. They lead the league in net yards per play at home. Furthermore, they have score 34.2 points per game in their last four at Soldier Field. And Trubisky has much better passer rating at home than away. As a result of all of the above, Chicago is 4-1 SU and ATS in five home games this season. Speaking of Tru, the Bears gain just 243.3 passing yards per game (20th). That’s out of 363.4 total yards per game (16th). And yet, they are among the top 5 scoring offenses, with 29.9 points per game. As for defense, Chicago’s is actually better than Minnesota’s. Has West brought Ripley back from the dead yet? The Bears allow fewer than 20 points per game. And just 84.0 rushing yards. So expect Cousins to have a busy afternoon. In all man vs. bear movies, the latter always comes out on the losing end. The Revenant. That one with Anthony Hopkins and Alec Baldwin. Those are pretty much it. Spoilers ahead: if this game were a movie about Thor battling Mikhail Uriokovitch Ursus, the Bear would win. And cover the NFL betting sites spread. Unless there is a twist ending, of course. Damn you, M. Night Shyamalan! At any rate, it’ll be a box office blockbuster. By which I mean both teams are overachievers, scoring-wise. The total has gone over in five of Chicago’s last six games. Those six games had an average combined score of 54.33 points. Additionally, four of the Vikes’ road games combined for 56.25 points per game.